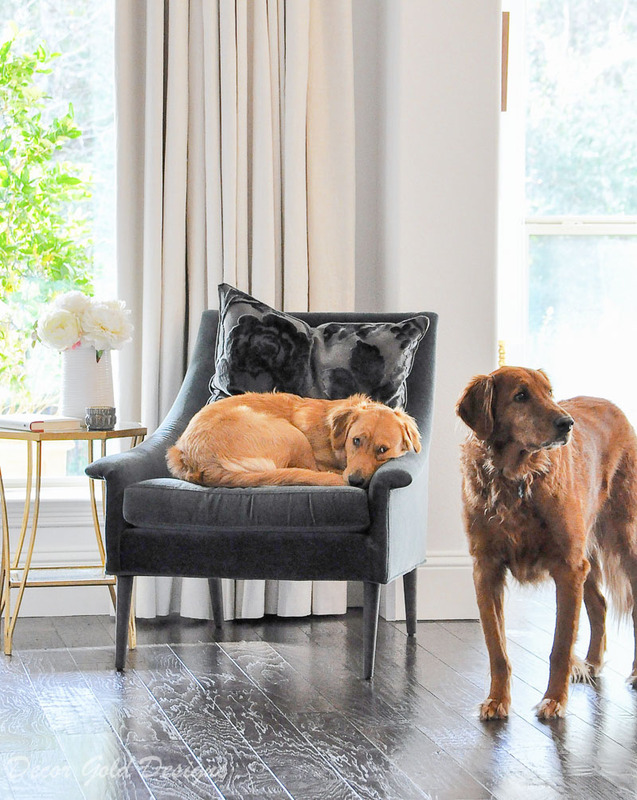 The question I am most frequently asked once others notice I have pets, “how do you keep your home clean?”. First, let me say that my home is not perfectly clean. It is not always in order. What you see here and on Instagram is not our real every day life. That’s not to say we don’t do our best to keep our home as clean and tidy as possible. Tony and I each make daily efforts to keep things in order. 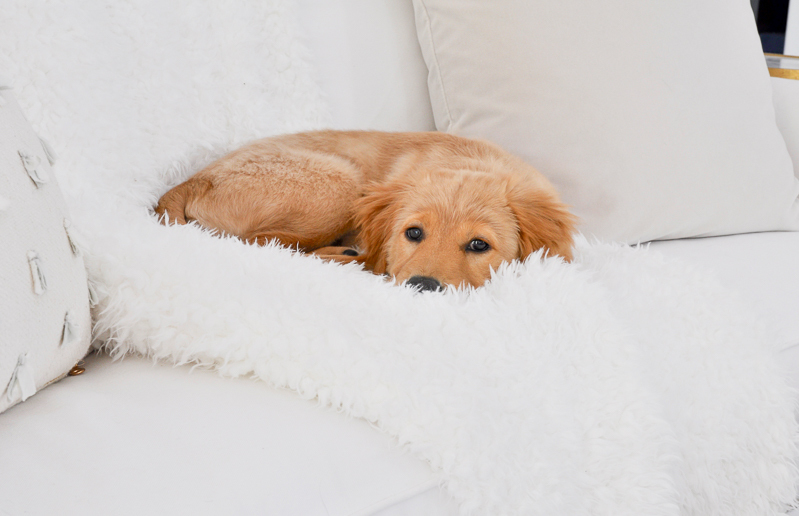 There are also a few extra things we do as pet owners to keep our home clean. I’ve had indoor pets most of my life. At one point, we had 4 golden retrievers and 2 cats! 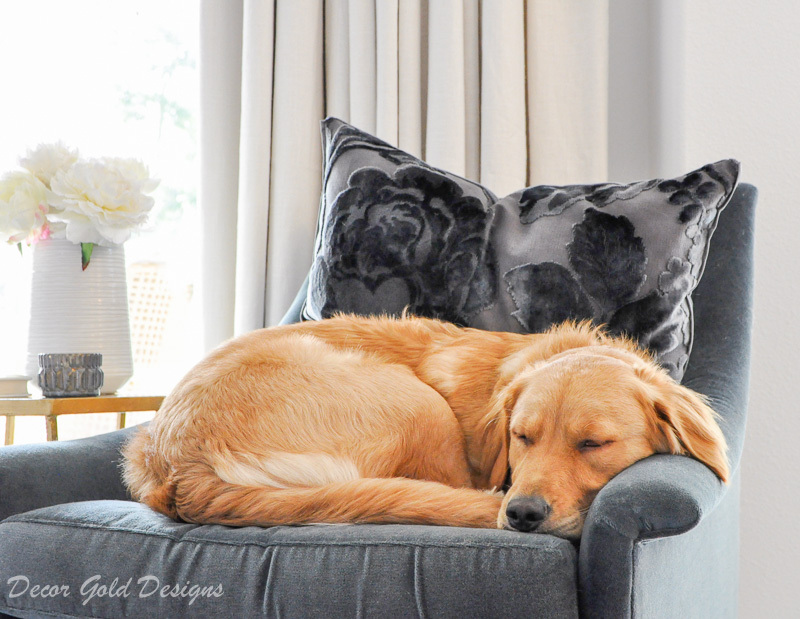 Cleaning can be more time consuming when you live with pets, but they are definitely worth it! Now, I want to share my routine, tips, and tricks with you! Practice these things and you can have pets AND a clean home! 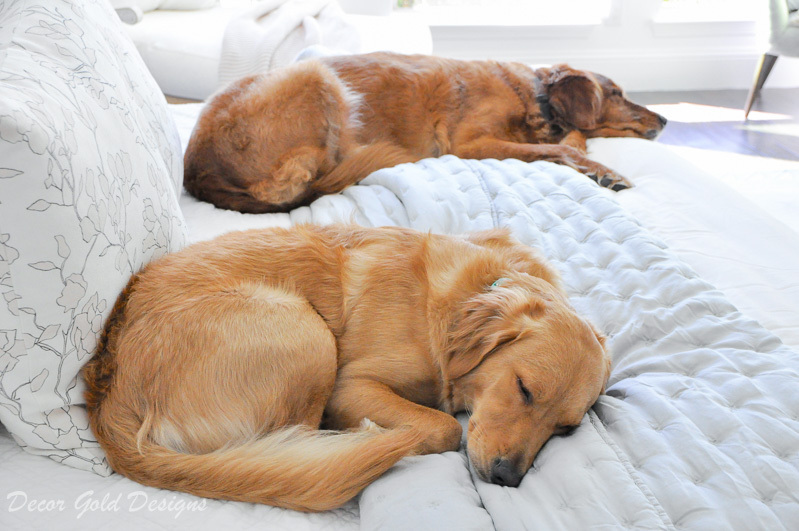 We now have 2 golden retrievers, but I follow the same routine as I did when we had more pets. Just remember, there may be a few things you will need to adjust based on the your lifestyle and the type of fur babies you have in your family. Start with your pet. Keeping your pet brushed and clean can make a big difference in the amount of pet-related cleaning you have to do in your home. Depending upon the breed, shedding can be a real issue. Our golden retrievers shed all year long here in Texas. To minimize this, we have them groomed and brush them regularly. Each breed is different, so be sure to research or ask your veterinarian for grooming recommendations. The best brush I have ever found is this one. Also, we ensure that our pets come inside with clean feet! You can try keeping towels by your back door. It will make cleaning their feet convenient. If it is has been raining, lay down extra towels for them to step onto prior to entering your home. You can also place a bowl of water at your entrance. Dipping muddy feet into water my take a couple of extra minutes, but could save you from mopping, shampooing carpet, or cleaning something much more difficult. Take the time to wash your pet’s bed, food and water bowls, leashes, and toys (check to make sure they are washable). I wash toys in the washing machine and balls in a sink full of soapy water. This is big. If you can keep an eye on your pets, you may cut down on your cleaning tasks. Of course all pets are different, but if you have a pet that can’t be trusted, keeping them nearby may save you cleanup efforts. 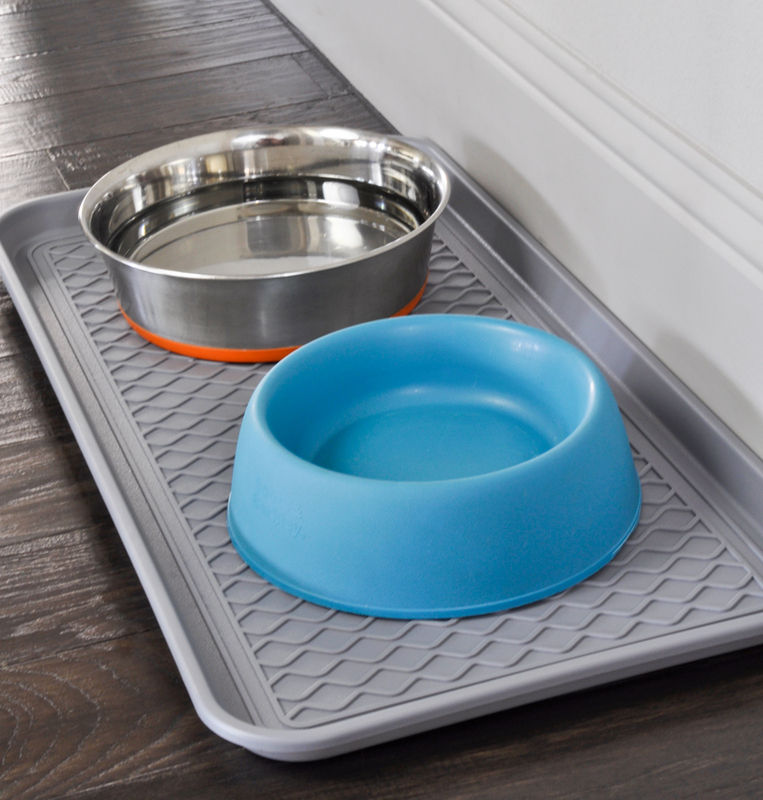 A mat (similar) for food and water bowls is a great way to cut down on mealtime messes. Another way you can eliminate some of your pet-related chores, cover some of their favorite surfaces. If you asked me to name the one item that I use most frequently, it would be a flat bed sheet. I use it to protect my sofa as you can see below. 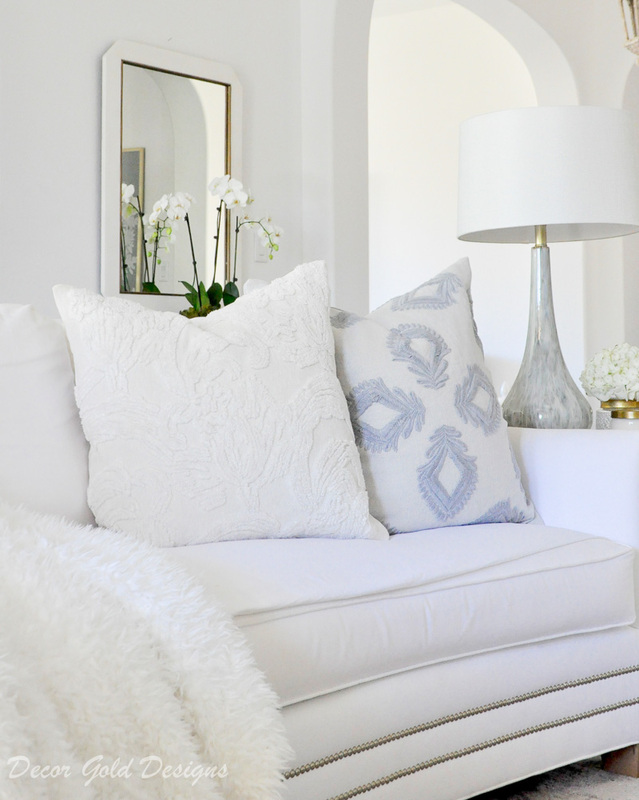 If you find a sheet in a similar color to your sofa, it will be barely noticeable. 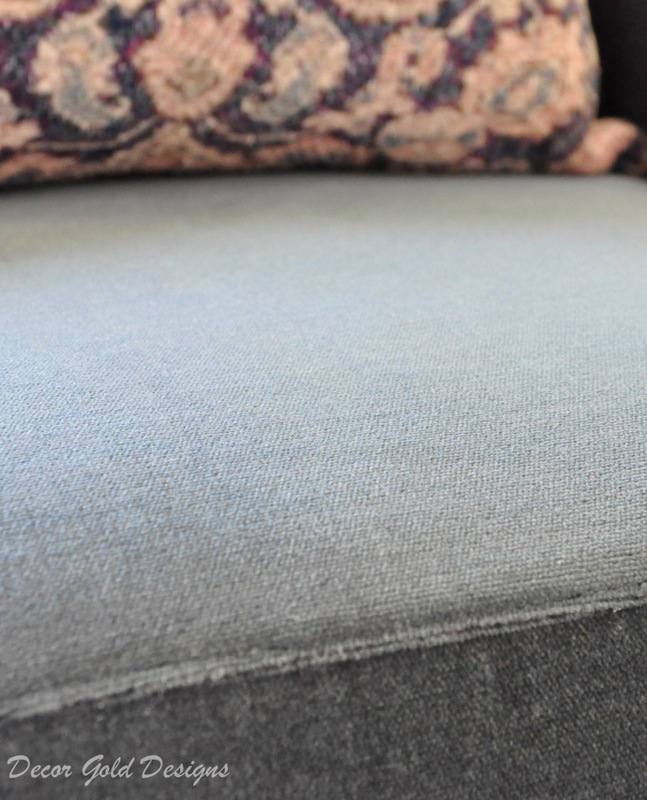 This works well in preventing your sofa from becoming hair-covered. The sheet catches most of the hairs and you can easily throw it into the washing machine. Switch it out and have a perfectly clean seat again in no time! 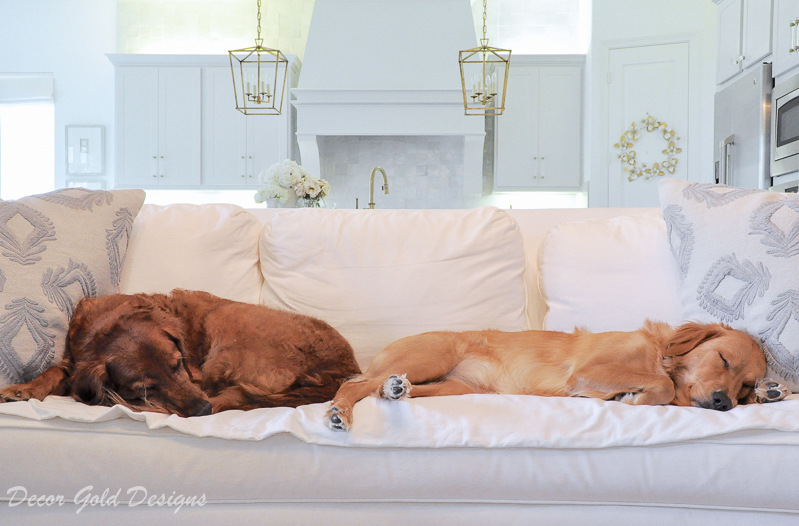 Here you can see our pups napping on our sofa with a sheet covering the seat. You can use throw blankets in the same way. This works especially well if you have cats or small dogs. If you have large dogs like we do though, covering more space works best. 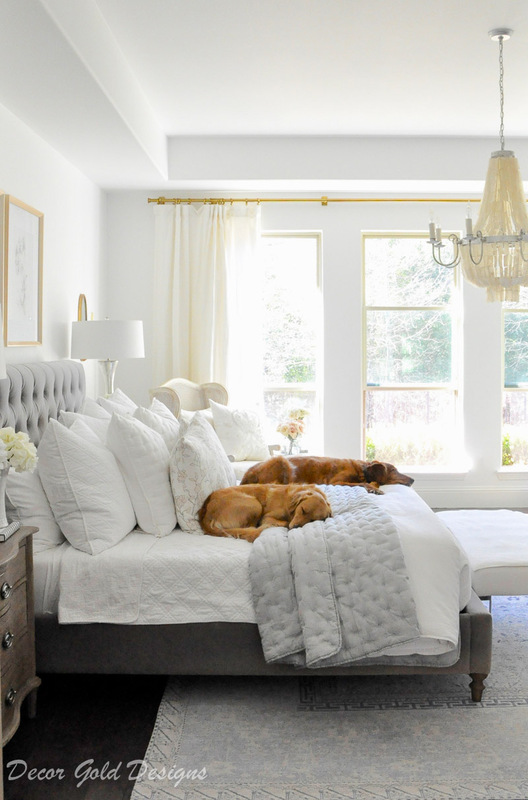 First, washable bedding is always a good choice if your pets get on your bed. All of our bedding is washable. Even so, I don’t want to have to wash my bedding constantly. When you see pictures like the one below, it is most likely because I was doing a photoshoot in my bedroom. These two usually make their way onto the bed for a few shots. When I leave the room, they do too. A normal day, before bedtime, this is what our bed looks like. A sheet works beautifully here too and we sleep with one on top of our covers every night. 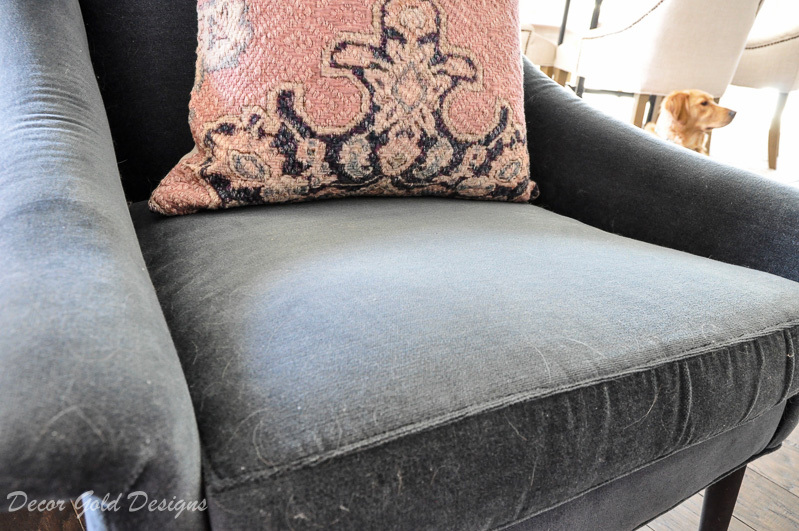 No matter how much you try to keep pet hair off of your furniture, you can’t eliminate all of it. See Ava in her favorite spot? Believe me, I have anxiety from posting this! But, I actually have a trick for tidying this up. Use a slightly damp washcloth to wipe down the fabric. (Of course it’s important to make sure this is safe for your fabric). It’s a quick fix and the chair will be clean! If you prefer to use a lint roller, this one is amazing! 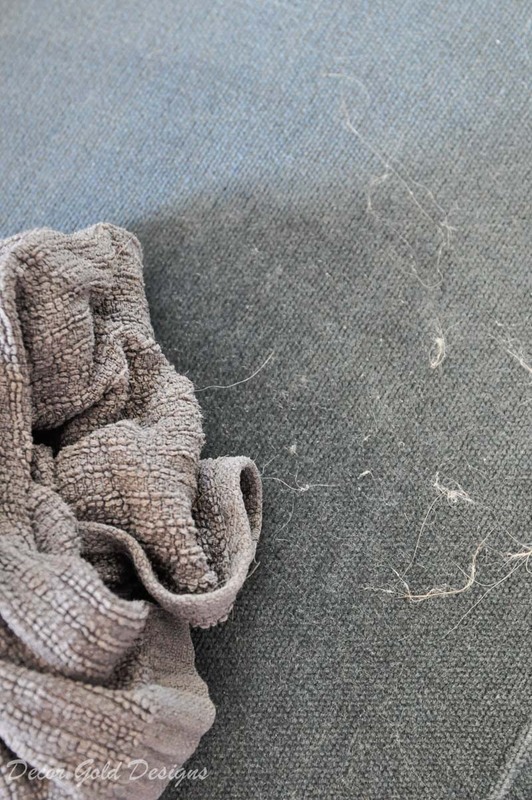 The hair and dirt on your floor…..isn’t it the worst? Each morning I use our robot vacuum (best thing ever for pet owners) in my bedroom first. Later in the day, I often use it in the rest of my house. If possible, I strongly encourage you to get this vacuum. It is so much easier than vacuuming your whole house with an upright. We also have a Dyson cordless for quick jobs and this Shark is the vacuum we’ve had for several years. We did our research on each before purchasing and they have lived up to our expectations. For best pet hair pick up, you should clean your vacuum regularly. If you don’t, the filter will smell like pet hair and dirt and spread the odors around your home. Also, be sure to remove the pet hair that gets wrapped around the brush roller. For reference, I have to do this 2-3 times per week. Note: Between vacuuming, this broom is a favorite of mine. It’s rubber bristles attract pet hair and works on both hard surfaces AND carpet! Simply opening a few windows for a few minute per day will make a big difference. I try to open windows on opposite sides of my home to create flow. We recently had a new piece of furniture delivered. That same night, Ava’s whole dinner came back up, right on top of the new piece. We reacted quickly with paper towels and cleaning rags and saved our new piece. When necessary, we use this enzyme-based cleaner to have the best chance of reducing odors. One last item we use frequently, our steam cleaner. It has been great to have on hand for cleaning chores. Love this post Jen! 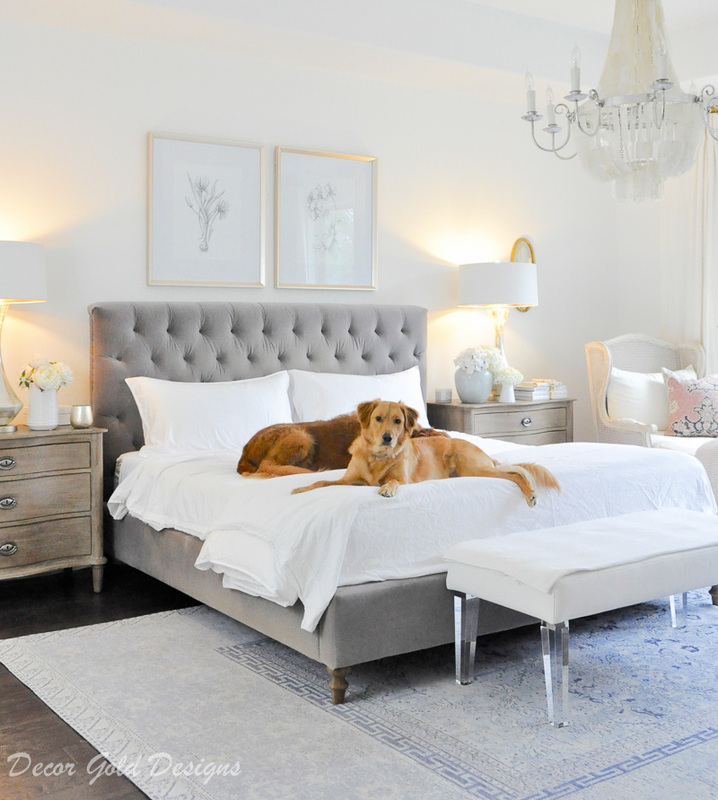 You are the ultimate testimony to having pets AND a beautiful house! Love this and you! Thank you for this post! Your house always looks so perfect, but now I love it even more knowing your two puppers get to enjoy its comforts. I have one corgi who also sheds year round, and living in Oregon means mud half the year, but I take many of the same cleaning/prevention steps as you. The Roomba is great – I love it. I did order that rubber broom from the link as well as a bunch of dog toys Amazon suggested while I was there 😉 ha! Speaking of toys – do you puck up throughout the day? Toy storage ideas? Thanks again. Thank you so much for your sweet comment Mary! I first found a rubber broom like that about 20 years ago. It is priceless! Hope you love it! I do pick up toys throughout the day, mainly when they are in my path. If I didn’t, our youngest dog would have about 72 out by bedtime! 😉 We use baskets for storage. I’ll gather a few nice-looking ones and add them to my post soon. Thanks for the great question! Yes, a pet does add to the mess but they are worth the extra effort. I bring my dog in through the garage and she lays on the rug in the laundry room until she is dry. I have a dog bed in the living room and another in our bedroom. She has been trained to not get on furniture. I brush her regularly and bath her when needed. We have had some accidents on the rug in the living room. I get on top of them right away. It’s like you read my mind. We have a cream retriever with dark wood floors. I have a army of Rumbas going at what seems all the time. Adore your style! 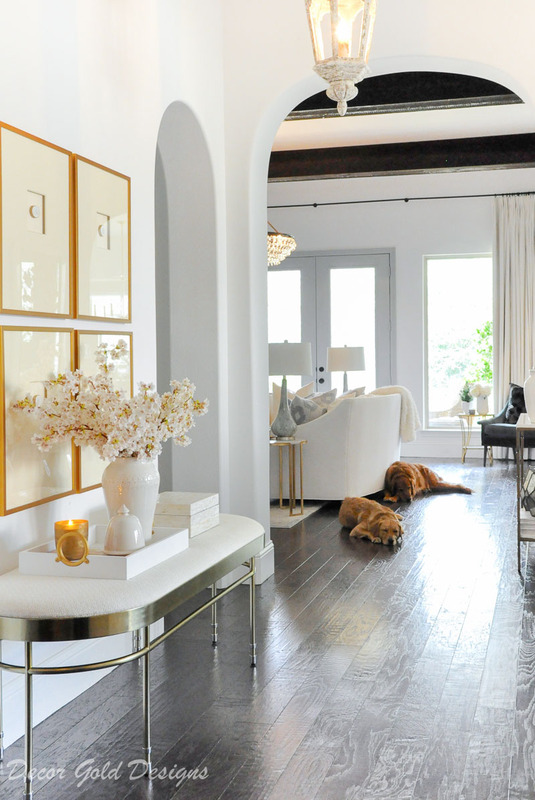 I always wondered how you keep your home so beautiful with two Goldens. We lost our 12 year old Golden a few months ago and miss her terribly. While we don’t miss cleaning up her hair and dirt a couple times a day, we are starting to feel the need to look for another one (I’m starting to research Golden rescue sites). This post is very timely for me (love the Roomba suggestion)…thank you. Thank you for this post. 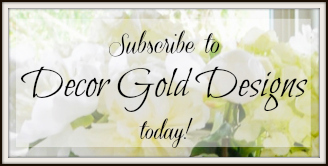 When I first found your blog and saw the beautiful Golden Retrievers on your white furniture, I was hooked.! We had just lost our 13 yr old beloved Golden.. I remember crying so many tears and thinking I would gladly clean up any mess to have her back.. It’s been almost a year and when we’re ready to add a new family member I will buy a robotic vacuum and extra sheets at the same time.! Do they scratch your hardwood floors? 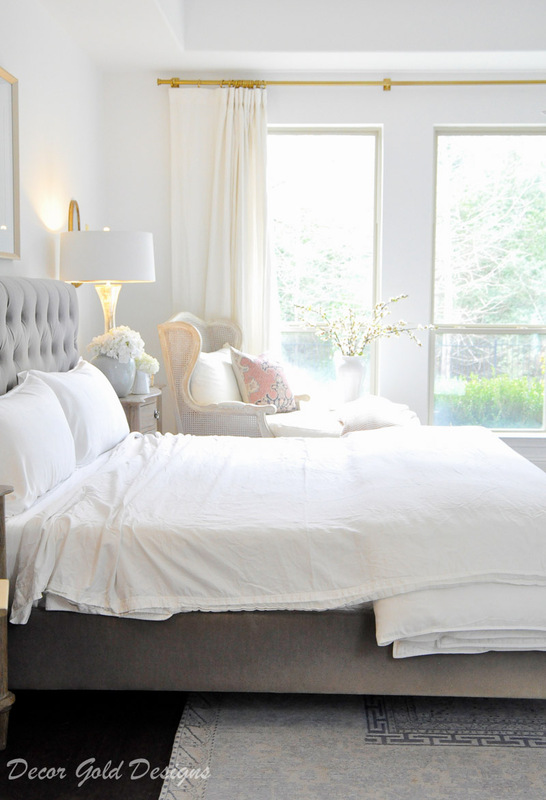 You are the queen of having both a gorgeous home, and fur babies. Wow! These are some great ideas. I tell people about the damp cloth on upholstery all the time. It works better than any upholstery vacuum attachment I’ve ever tried! I just love seeing pictures of your fur babies so happily lounging and sleeping!! Great tips! I am lucky to have one non-shedder and our Doberman is short-haired so she is not much of an issue. We do, however, also use a top sheet every night because we cannot resist them not being with us. 🙂 Gonna check out the broom for sure! Very inspirational! I have a 13 month old daughter and a 7 year old pit bull, they are best friends that make the biggest messes! Thank you for sharing, really love how bright and light everything is in your home but the warmth is evident as it’s surrounded with love filled with doggies! I actually use baby wipes for my dogs paws that i leave by the door to clean his feet but a towel is a must when it rains or snows. I must try the wet towel for the couch, thanks again! I seriously thought a Robot vacuum would never work with a Golden and 2 cats. It would need to be the size of a shop vac rolling around the floors to keep this place clean. Luckily my hardwood floors are the same color as our dog. I really don’t see the hair until I get out the Shark Rocket with that LED light on the front and then all the hair is illuminated!!! Thank you for this post and for keeping it real. 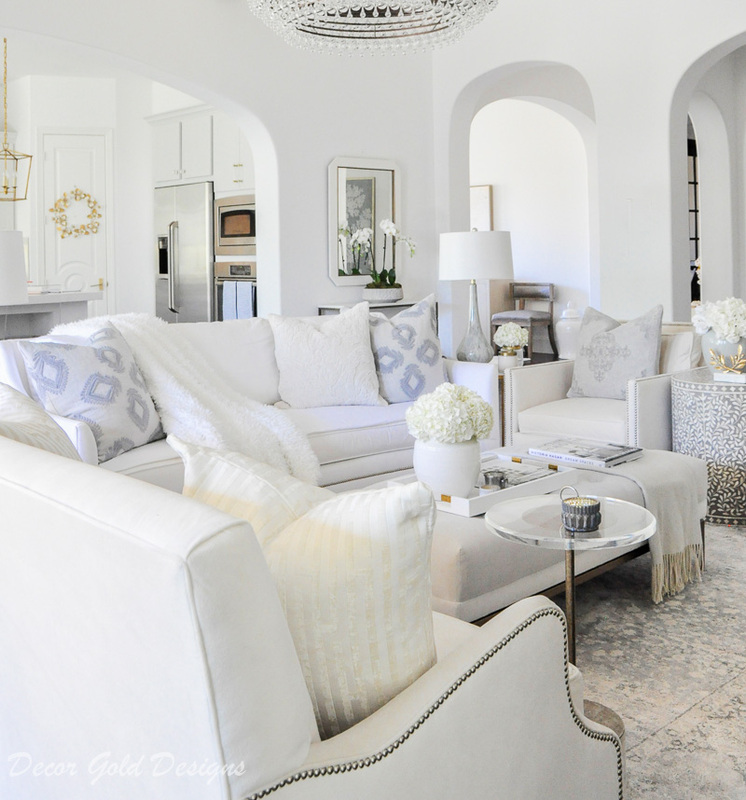 Sometimes it is very hard seeing all these beautiful homes on the blogs and feeling like you just can’t keep up. Beautiful home! How do you keep your dogs from scratching your wood floors? This is a big worry for me!! Thank you! Hi Lisa! Great question! We simply keep their nails trimmed. We trim them ourselves sometimes, and we also have our vet trim them during appointments. Hope this helps! 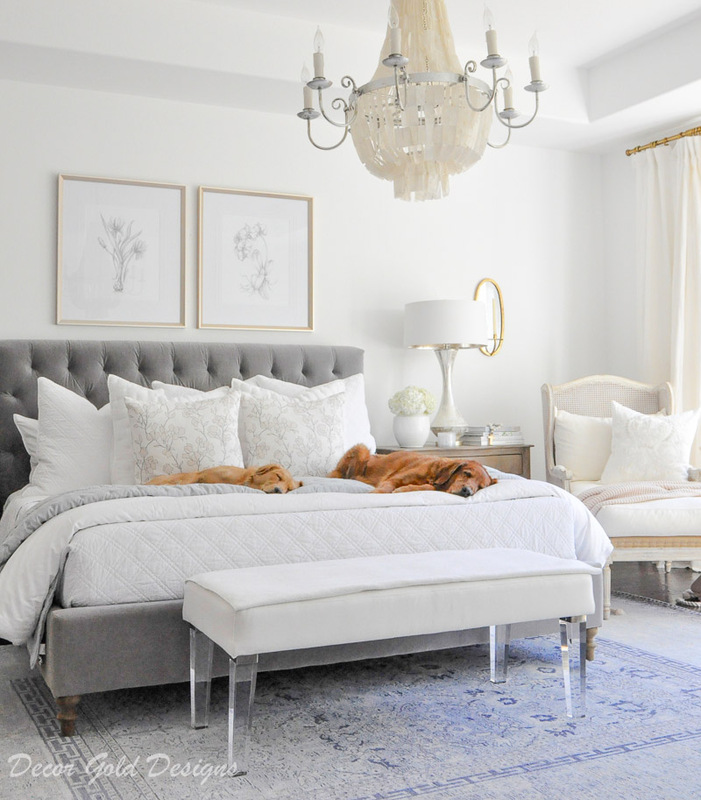 Really helpful post about a clean home with a pet. I also have a pet and I know how hard it is to clean home while having a pet. How much I try to clean the hair of the pet from my dress and bed through hand it took a lot of time but now I got the tricks. I will apply these tricks to clean my home. Thank you for sharing.